The Oglesby drumline was the opening performance at the 1st ever Network 11 Educator Awards February 21, 2019! Community Meeting: Space to Grow and Westcott Elementary New School Yard, All Are Welcome! 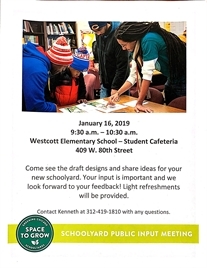 On next Wednesday, January 16th, Space to Grow and Westcott will have their first community meeting for the new schoolyard. You all are welcome to join. The meeting will be from 9:30 AM - 10:30 AM in the cafeteria. See attached flyer for details. Five schools were selected earlier this month for participation in Space to Grow, an initiative that transforms Chicago schoolyards with the goal of providing kids in low-income neighborhoods with safe spaces to play and recreate.